When I first started recording my thoughts online, I never in a million years thought the journey would lead to some of my favorite people in the world. I started out as a Lila Loa stalker in 2010, and was so enchanted with her whimsical, imaginative designs, that I basically harassed her until we were friends. Seriously, though, all these years later, I am still left speechless by the simple, yet striking designs that made me a fan in the first place. 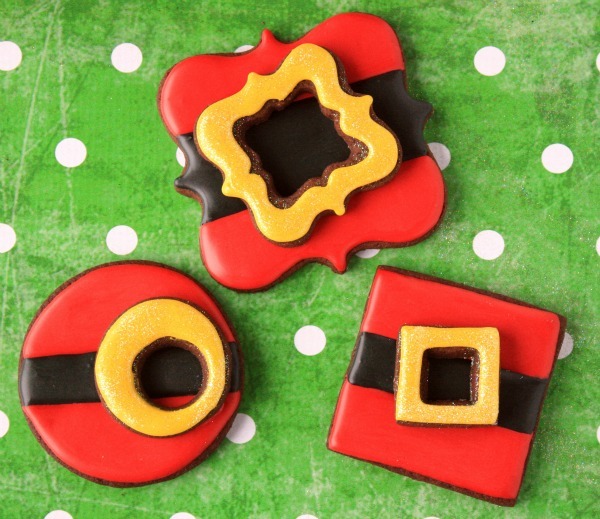 Her simple santa buckle cookies are no exception, and easy enough that if you start right now, you’ll have cookies in time for Christmas morning! I always have big plans for December. 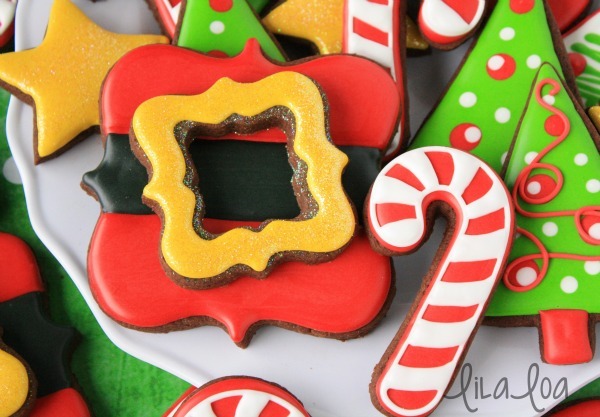 Festive cookie parties for all the neighborhood children… being ready for Christmas by the 7th… just hours and hours of downtime that I spend cuddling my children under blankets while watching the storms outside our window… It never really works out that way. I always find myself on December 22nd wondering what just happened. My house is a mess, my clothes are a mess, I can’t remember if my kids ate breakfast — EVER– in the entire month, and a stack of cookies that feel alone and forgotten because they never really got the icing they deserve. 1. Outline and fill the largest cookie with medium consistency red icing. Leave the middle stripe empty. Let the red icing fully dry for at least a couple of hours. 2. Fill in the middle stripe with medium consistency black icing. 3. 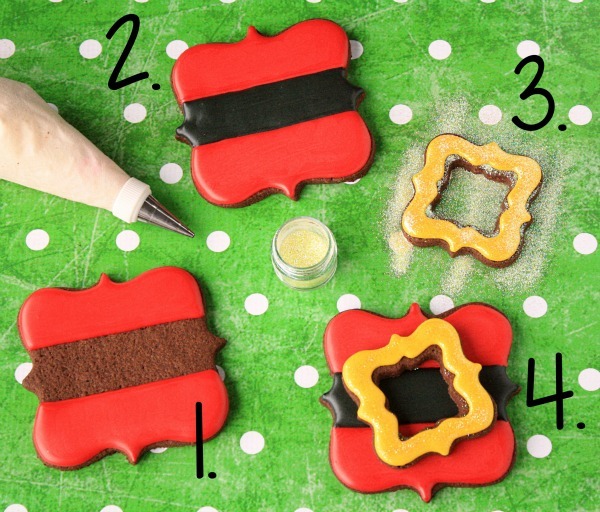 While the black icing is drying, outline and fill the medium sized cookie with yellow icing. Immediately sprinkle with sanding sugar or pixie dust. I used “baby yellow” but you can use any color you like. They’re your cookies. 4. Pipe some icing on the back of the buckle and push it gently on top of the large cookie. And… DONE!! You’re basically a December super hero at this point. I hope you all have a Merry Christmas and somehow find that time for snuggling on the couch with someone you love!!! Thank you so much for inviting me over Callye! Merry Christmas! These are absolutely adorable! I don’t know where you get you ideas, but I enjoy everything you do! Hoping your day is filled with joy! This is VERY delayed, but I am determined to get back to blogging…my true passion, and it always makes me smile to see your name come up, here, and on Facebook. Thanks for the support and encouragement. It means a LOT! First off, I would like to say thank you to you and all the cookies out there who are so generous with your tutorials, techniques, tricks, and tops. Without your kindness in sharing, cookie decorating would be very painful. For this coming year, I would like to act on my good intentions more often, rather than just think of doing them. Any act of kindness whether big or small is better than no act. Thank you for the 12 days of giveaways. So much fun! I just love your cookies! So incredibly whimsical and beautiful! I have tried and failed so many times with the icing appearance. I have followed the recipe (sweetsugarbelle) every time, but my overall appearance of the icing is matte, dry looking, no sheen or semi gloss appearance as yours. I tried the low fan on them when drying..etc. Could it be my extract brand? I use Wilton. Hi, Tina, in an attempt to get back to my previous blogging schedule, I’ve gone through and cleaned up a lot of the comment threads, and I am trying to answer questions I missed along the way. I am hoping that you were able to solve the shine issue, but of not, let me know, and I will share a few more tips that might help. Thank you for the support, and patience! 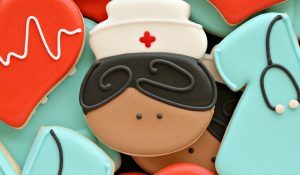 I love your site and you make beautiful cookies. I can’t wait for your Valentines post. May I ask where to find the cutters to make the buckle? Do you know where she got the cutters for these? Let me ask her…and sorry this is TWO YEARS LATER! It’s been a struggle to get back to blogging with my new endeavors, but it’s my #1 priority this spring. If you already figured it out, I am sooo sorry for the delay. If not, I will add links to the post when I hear back! And yes, we can definitely be friends, no harassment necessary, lol! I love friends! I tried to send this via contact me, but it wouldn’t send, so I’m posting as a comment instead. I will start by saying BIG FAN BIG FAN BIG FAN. 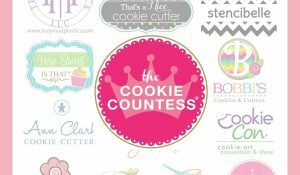 When I first discovered your work I almost gave up on my little cookie hobby. 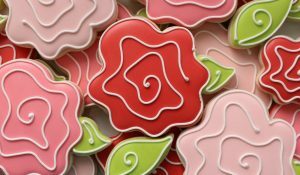 I was so humbled by what you did that I thought to myself, “I have no business even owning a cookie cutter!” That sentiment didn’t last long, and the more I looked the more inspired and motivated I was to get better. These days friends and family wait anxiously to see my latest release. 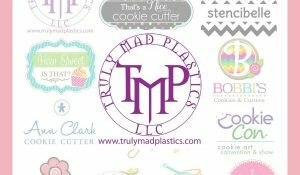 They encourage me all the time to go into business, but I’m firm in my devotion to cookieing as a hobby I love, not a business I will grow to hate! Anyway, my skills and imagination have evolved immensely and you get most of the credit for that! Now that I’m done fawning, I am hoping for advice from the wisest cookie I know (that’s you, by the way!). 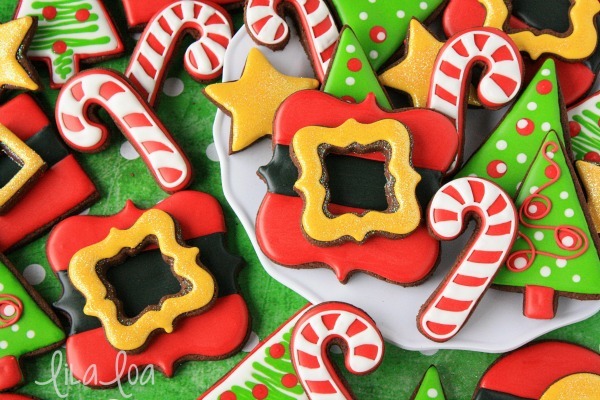 I am having a heck of a time creating royal icing that is suitable for construction (ie gingerbread houses and attaching sticks to the back of cookies). I’m talking about that awful-to-eat-but-indestructible icing that dries fast to the consistency of concrete! My icing (made with merangue powder and more or less following your recipe and technique) generally has a slightly tender consistency (which I love and so do my cookie eaters). Slightly glossy, with a firm and solid finish that holds up to stacking, etc., but doesn’t get that way super fast and isn’t heavy duty enough for building. I cannot figure out how to get that construction consistency I need for structural purposes. A few weeks ago I tried multiple variations in an effort to achieve it and the end result was a lot of icing in the garbage and no cookies glued to sticks. Do you have any suggestions for me? Note that I live up in Toronto, Ontario, Canada. Anyway, I hope all is well – I know you haven’t been blogging much lately and no doubt there are life reasons for that. If you have a chance to consider my question that’s great, and if not I do understand. I’m sure you get a lot of requests for help every week! All the best to you and thanks so much for all the inspiration you provide! Hello! Sorry for the much delayed answer, but I am okay. It’s been a challenge to juggle my new endeavors with my previous blogging schedule, but I feel like I am finally to the point where I feel like I can really focus on my blog again, which is my true passion. I am feeling more inspired, and am looking forward to sharing my creative ideas. Thank you for checking in and sticking with me! It means a LOT! wondering if you are still posting? i love your blog but have been missing you! I was wondering the same thing too. I haven’t seen a new blog since Christmas. Hi Ally, this reply is actually a repeat, but it kind of says it all. Sorry for the much delayed answer, but I am okay. It’s been a challenge to juggle my new endeavors with my previous blogging schedule, but I feel like I am finally to the point where I feel like I can really focus on my blog again, which is my true passion. I am feeling more inspired, and am looking forward to sharing my creative ideas. Thank you for checking in and sticking with me! It means a LOT! Hi Stacie, this reply is actually a repeat, but it kind of says it all. Sorry for the much delayed answer, but I am okay. It’s been a challenge to juggle my new endeavors with my previous blogging schedule, but I feel like I am finally to the point where I feel like I can really focus on my blog again, which is my true passion. I am feeling more inspired, and am looking forward to sharing my creative ideas. Thank you for checking in and sticking with me! It means a LOT! 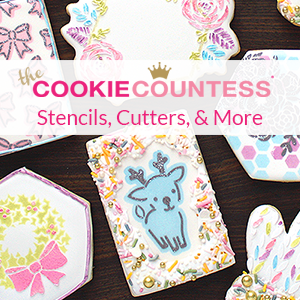 I am new to this awesome cookie world of decorating, but this looks like the perfect place to start…I can’t seem to find a graduated set of cutters in the square plaque shape. Can u direct me on where to buy those? Hello! Sorry for the delayed reply…this thread somehow got BOMBED with spam! I got it all cleaned up, and I am trying to answer all the questions. At this moment, I am not sure where Georgeanne got the cutters, but I am going to ask, and I will add a link when I hear back. Thanks for your patience!